There are quite a few stories about the history of the baleada, the most popular Honduran street food. The most interesting that I have heard goes as follows: There was once a woman from La Cebia who sold delicious wrapped tortillas. One day, out of nowhere, she was assaulted and was killed by a bullet. The word for bullet in spanish is balas. The woman was so adored for her cooking that from then on when people went to a restaurant they would say, “we are going to the baleada” (baleada in spanish means literally, shot woman) instead of “we are going to a restaurant” in honor of her. Today, a baleada is a homemade, wheat flour tortilla that is thicker than traditional tortillas. It is most commmonly filled with mashed red beans and cheese. 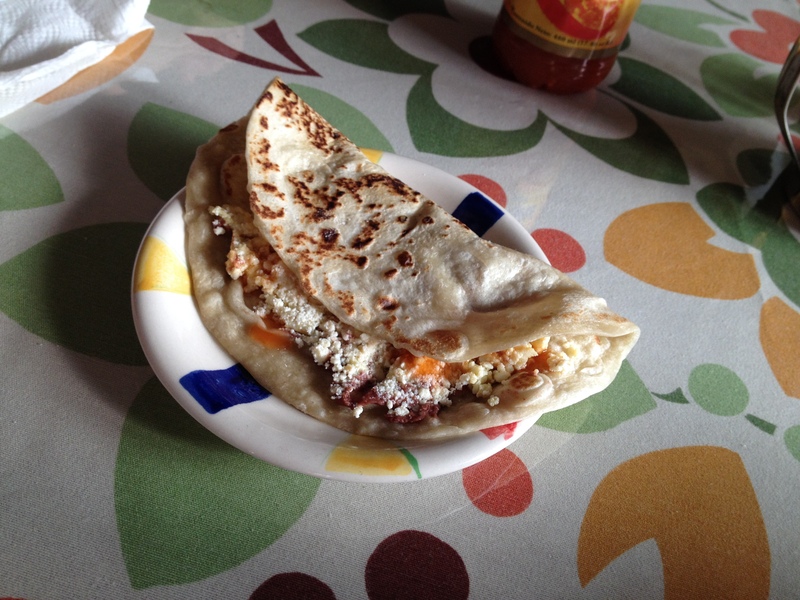 A super baleada typically has scrambled eggs, sour cream and a choice of chicken or ham. Once filled, the tortilla is folded in half like a crescent moon and toasted lightly. I prefer mine without meat and topped with local Honduran hot sauce. Baleadas are a super affordable way to get in some good local eats, especially if you are eating on the go. Fourteen hour travel days. That is what’s becoming the new norm for country to country journey’s and honestly it can be tough on our constitution. We’re begrudgingly getting accustomed to it though and our journey to Honduras with our new Aussie friends Josh & Kim was no exception. A nine hour boat ride from Placencia, Belize to Puerto Cortes, Honduras followed by a five hour car ride to La Ceiba where we arrived in Honduras’s gritty beach city around 11pm. Prostitutes walked the streets as we slid through a cracked fence to our otherwise empty hotel for the night. The machete wielding hotel keeper led us to a deplorable but serviceable room to rest our heads for 7 hours until the first morning ferry that would finally take us to our destination, the island of Utila, Honduras. Leaving La Ceiba would be exciting enough, but getting to the coral reef ringed Bay Island was the chance for Laura to fulfill a life long dream. Scuba diving. We couldn’t wait. Utila is one of three Bay Islands, the other two being Roatan and Guanaja. With a permanent population of about 3,000, it is considered one of the top backpacker destinations in the world for one primary reason, scuba. 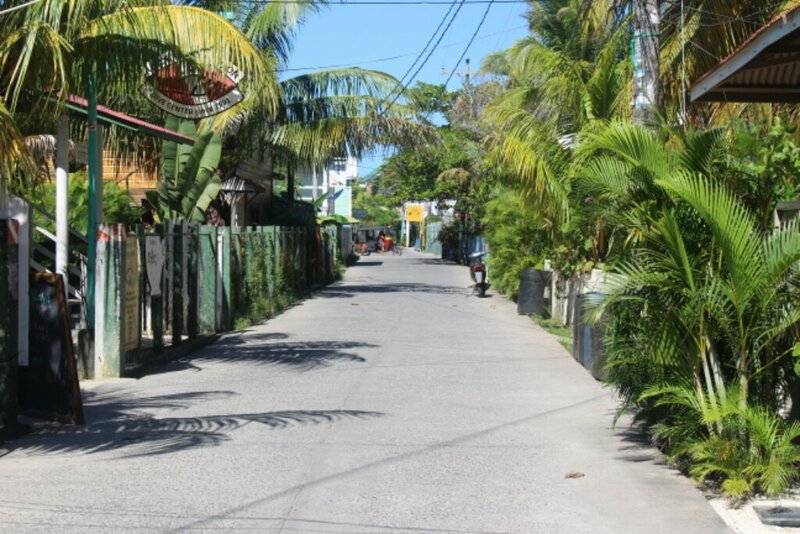 Utila is most widely known for being the cheapest place on Earth to get scuba certified. That was our plan. 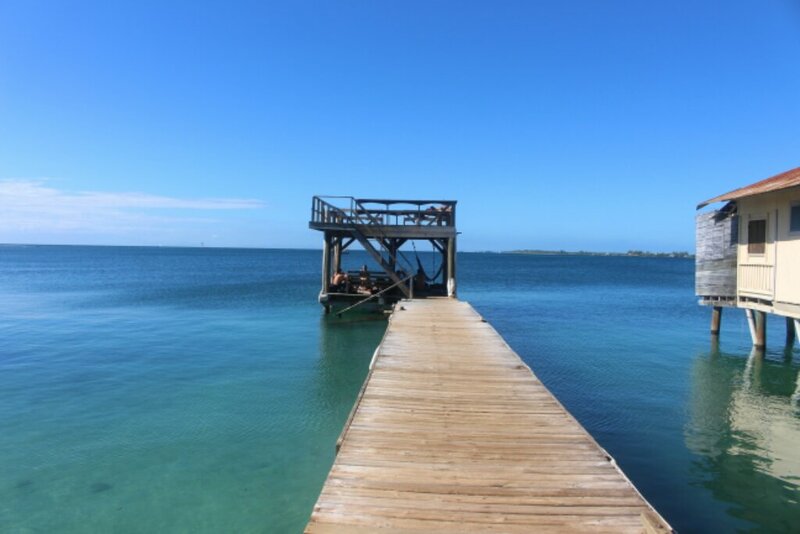 The shores of the small island are lined with scuba schools that all offer 5 days of classes with 6 dives and include 5 nights accommodations at their affiliated hotels for about $270 per person. A big splurge for our budget but super cheap comparatively and hey, did I mention it was Laura’s life dream?! We settled in for our week of school and by mid-week we were swimming effortlessly 50 feet down in the deep blue at several of Utilas more than 80 dive sites. Snorkeling, you are amazing, but you’ve got nothing on scuba diving. Gliding along beautiful 100’ coral walls with day glow anemones, we found ourselves surrounded by huge schools of bright purple Creole Rass, giant yellow Angel Fish and dozens of other equally amazing species. On the final dive we even made our way down to a barnacle covered shipwreck! It’s a whole different world down there. One thing we quickly learned is you can travel far and wide but until you travel below, you’ve still got plenty of this amazing planet to explore. We will definitely be diving again soon. As Laura says so exuberantly…¨We’re divers now!¨. We spent Christmas in Utila. Like many Latin American countries, the holiday season in Utila is celebrated with fireworks and the streets were filled with children (and us) shooting off rockets and setting off firecrackers 24 hours a day. It certainly wasnt a traditional Dan and Laura Xmas but it will definitely stick in our memories as one of the weirdest. Not being with family and friends at this time of year is especially hard but we’re getting by. It’s part of life away but it’s definitely the hardest part so far. On Thursday we began our trip away from Utila in a torrential rainstorm. We crossed the island on foot in flooded streets with rushing water almost up to our knees. A soaked hour long ferry ride later and we began a record setting (for us) 16 hour van ride to Leon, Nicaragua. Total door to door travel time…18 hours. Painful. The journey is half the fun they say, but ¨they¨have clearly never been in a packed van for 16 hours… in 90 degree heat… without air conditioning. C’est la vie. Until next time, Feliz Navidad everyone and Happy New Year!